I spent the weekend installing the underlayment on my new laundry room roof. The first step was to add a cant strip along the wall of the house, which the previous roofer hadn’t bothered to do. 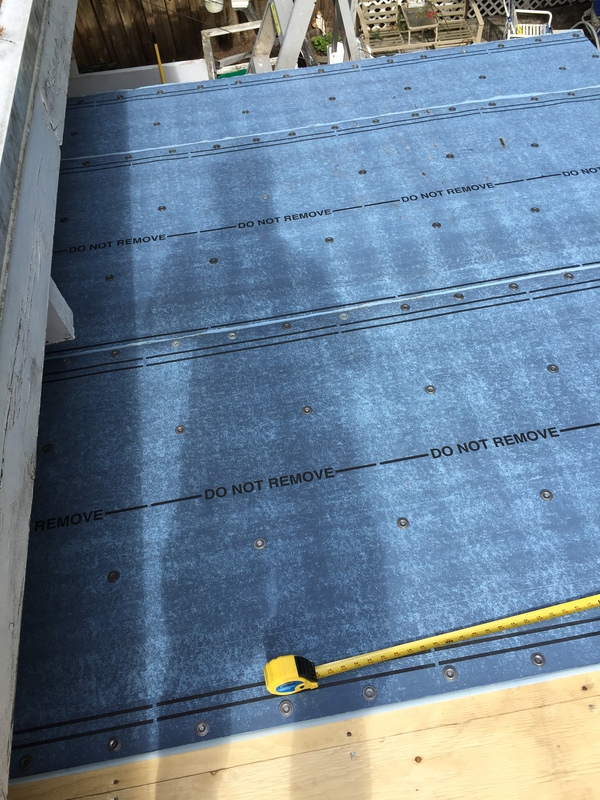 Cant strips are triangular pieces of wood that go in the corner of the roof and the wall so that you can have the underlayment and cap sheet go up the wall without folding and cracking. 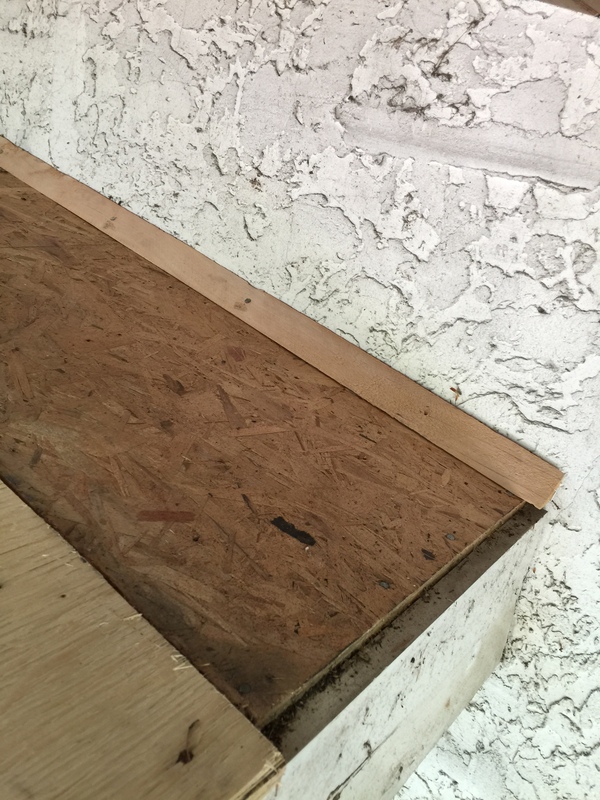 The picture on the right shows the sheathing, a 1 foot strip of which is the original strand board, with the cant strip nailed in in the corner. After nailing in the cant strip, I nailed on the flashing along the eave (the bottom edge of the roof) with roofing nails. On the bottom edge (only), the flashing is installed under the underlayment. Nex t, I added a half course of underlayment (1 1/2 feet high, instead of 3 feat high) and nailed it onto the sheathing, overlapping the flashing at the bottom, and going 2 inches up the wall of the house. I continued up the roof, adding 3 full courses of underlayment. The underlayment is asphalt with a rubberized coating on top that the top cap sticks to. You nail it on with cap nails. The picture on the left shows the half course (at the top) and the first two full courses. The courses overlap by 2 inches. Once the underlayment was done, I nailed on the flashing on the side and top edges of the roof, making sure to work from the bottom of the roof. On the recommendation of Rick at the Roofing Store (now part of Beacon), where I bought the roofing material, I roughed up the top of the flashing with sand paper. I then applied a coat of Karnak quick drying asphalt primer. The can neglects to mention the fact that quick drying means 4 hours. This entry was posted in diy and tagged asphalt primer, cant strip, cap nails, certainteed, fintastic, flat roof, karnak, roofing. Bookmark the permalink.